These are a perfect shade of beige and a heavy blackout curtain that you can use all year round. I compared these to RH and like these so much better! 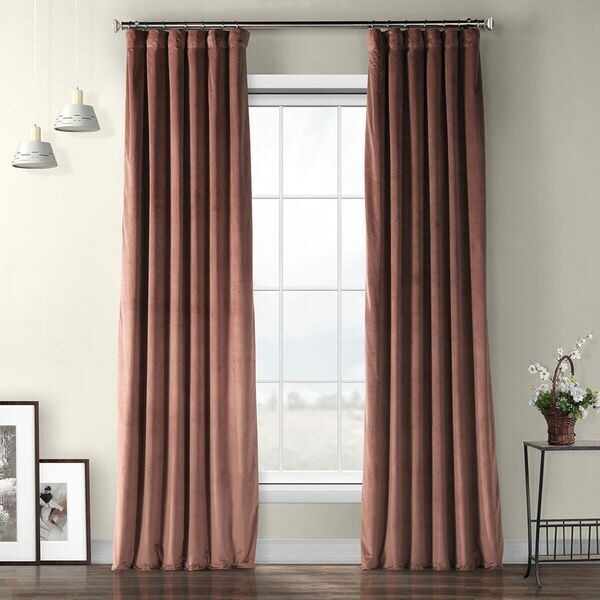 A supple texture and a vast variety of hues, not to mention a hybrid design compatible with rod pocket and back tab headers, make for a charming curtain panel design, indeed. With a sleek polyester velvet construction, it's bound to satisfy even the pickiest of curtain snobs. Small: 50 inches wide x 84 inches long x 0.25 inches thick / weighs approx. 5 lbs. Medium: 50 inches wide x 120 inches long x 0.25 inches thick / weighs approx. 6 lbs. Large: 50 inches wide x 96 inches long x 0.25 inches thick / weighs approx. 6 lbs. XL: 50 inches wide x 108 inches long x 0.25 inches thick / weighs approx. 7 lbs. Buy them if you can find them! These curtains are simply gorgeous. The moment I took them out of the box, it was clear that they’re very high quality. They’re heavy and thick with a smooth lining that doubles on the cold and light blocking qualities. Between the weighted bottoms and the fabric itself, they hang very well. One unexpected plus was their sound-damping quality. 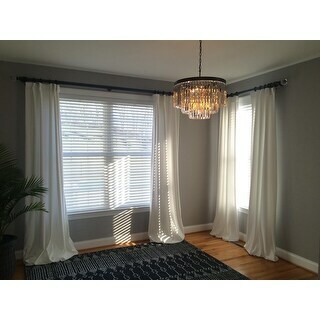 I have them in a large room with high ceilings and wood floors, so adding these curtains instantly cut down on echos. Note that you’ll have to steam them, but wrinkles fell out very easily. My only complaint is how hard they were to find. I needed 8 panels and had to buy from three retailers! Luckily the color was consistent! I will probably buy more in other colors as I remodel my home. Oh, my goodness, I ordered this curtain and was never so shocked and upset in my life. Never have I seen such an UGLY COLOR, now I have to return them and this time I will be holding my breath. I have never ever seen Wild Rose in an ugly muddy brown. The color that you show is in no way near what I received. It looks like some one ran these curtains through the mud and then tried to pass it off as the wild rose that you show. 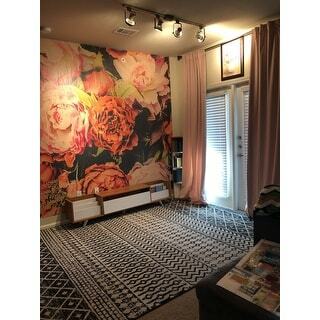 I think the curtain is made beautifully but if I were you I would not even think about selling that color, Wild Rose. It is in no way the pretty color that you show on the computer and there is really no way a real Wild Rose color could go so wrong. I don't want to be told that all computer vary in color because that color I received is just plain and simple the most *** awful color I have ever put my eyes on. So, I am returning the WILD UGLY FOR ANOTHER COLOR because the curtain is just so very well made and feels like heaven, but OMG please cover your eyes if you order the Wild Rose it so awful, I thought I was going to go blind. Didn't realize single panel not pair when ordered. Returning unfortunately. Very heavy and wide panel. Wouldn't use on a single size window. Better for use with a double window when you order two. Nice material &amp; color true to picture. I was worried to order these but trusted the other reviews. I am glad I did. 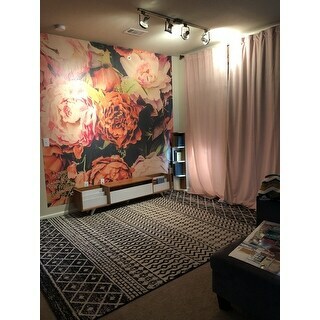 These curtains are exactly what I wanted for my office. The fabric is very soft and puddles on the floor beautifully. I ordered pillow white 108". The color is exactly what I was hoping for: not a bright white, not a dingy white. The best way to describe the color is "milky" white. 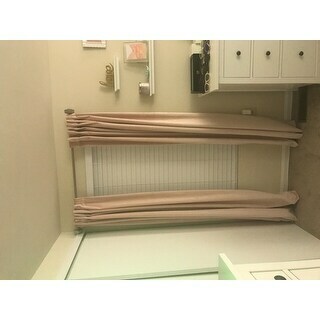 The curtains are fully lined with several options to hang. 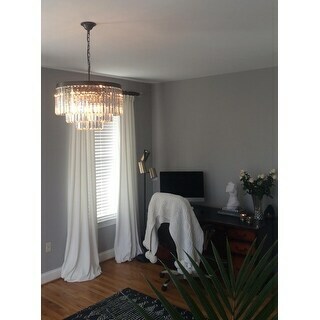 I hung them using metal hooks to give them pleated look. They ironed easily (on the reverse side) The only complain I have is that 2 of the six curtains had some minor stains, I wanted to exchange them but the color and length are sold out. Thankfully the stains are in the area where they are not easily visible. I hope Overstock brings them back. Great curtains. Thick curtains and blackout sunlight. Color is great. HERITAGE PLUSH VELVET CURTAINS ARE BEAUTIFUL THE COLORS JUST BEAUTIFUL. I bought these for our nursery, they are a beautiful light pink color and the quality is excellent. Would definitely recommend these to someone looking for a thick velvet curtain. As always, love these curtains! I’ve bought these velvet curtains in 5 different colors. They are always soft and perfect. The weighted bottoms are a huge plus. You really can’t go wrong with these curtains! Highly recommended! These are exactly what i was looking for. They're plush, heavy weight semi black out curtains. I wouldn't say they're 100% blackout (I did buy white so, to be expected) but they're about 80% blackout i'd say. I suggest steaming them once they're hung, and if you buy the pillow white, do not let them touch the floor or anywhere dusty. They true to the measurements and have rod pocket and tab options. Absolutely stunning. I ordered the amber/golden curtains. They were color perfect to the picture, are heavy and well made. My only complaint and reason for 4 out of 5 starts is that they have some wrinkles in them. I will have to find a steamer to get them to the perfect state. Other than the wrinkles, I am very happy with the curtains. These add elegant touch to any room. Look and feel soft and cozy. Does not block out any light however. Still a great buy! These drapes are beautiful, very heavy. I ordered spice rum color was great. weighted bottoms to hang straight. White lined so they look great from outside of home as well. I Love these drapes. I love my velvet ballet colored curtains bc the are great quality and keep out the heat from outside and blocks the sun. Also perfect color for my room. Love them!! I had been looking for the perfect pink and these are it. This drapes are not ivory, they are beige. Very disappointing since they were such a good deal and then I had to pay to ship them back. Perfect for our daughters nursery!! These curtains are so soft. I love the tabs on the back of the curtains as I don’t care much for the rings. You can pretty much unpack them and hang them - no steaming required. The color on the stock photo seems a little light to me but the review photos show their true color. Can’t wait to see these hanging in our living room. 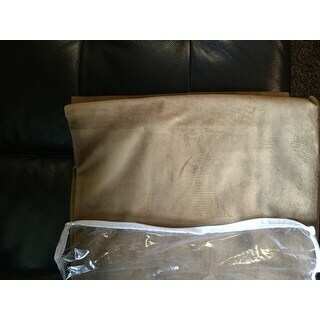 Ordered taupe- the quality and color are perfect for what we were looking for. The material is rich and heavy- love them! Bought the Pillow White color for the nursery and they DO NOT block out any light whatsoever, even with blinds behind them. Small rust stain when I held up one of the panels against the window. Perfect color and super soft. They are definitely room darkening but not as thick as I would have expected based on the reviews. They worked perfectly for a kid bedroom. Absolutely stunning drapes!!! 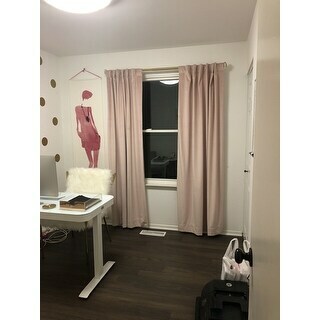 Description of color as “Ballerina Pink” is right on target Adds a soft hue to the room that is the perfect finishing touch to my daughters new bedroom which faces east as our new home is waterfront and the sunrises light up her room like a spot light!! 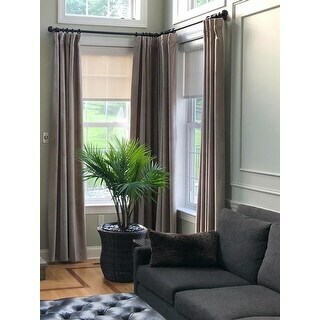 We need a quality drape to defuse the early morning sun with out that stiff artificial feel of most black out drapes Are thick plush heavy and well worth the price Well done OS Is a 5 star purchase!!! "Is the vanilla a ivory/beige white or a gray white. Hard to tell from the photo. I am trying to decide between pillow white and the vanilla." The vanilla is a very warm cream color. It's not as yellow in tone as an ivory, but this fabric is not grey. "How should you spot clean the ballet pink curtains? I accidentally got a pen mark on one panel! :-("
"If you are going to use hooks to hang them, what do you attach them to on the curtain?" The hooks are inserted directly into the back of the header. "How many hooks/pins per panel? Thank you "
For a 50" width, 6-7 hooks. 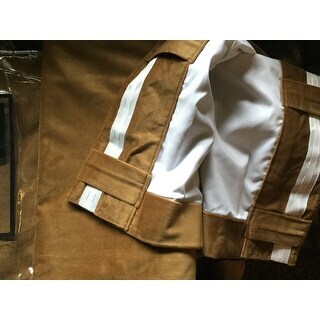 "Are these panels thermal & blackout lined"
This item only has standard lining. "Is it just one curtain that comes per order or is it a set of 2?" Just one. They're pricey, but worth it! "I am in need of the Ballet Pink in 96"L. Can will they be back in stock??"